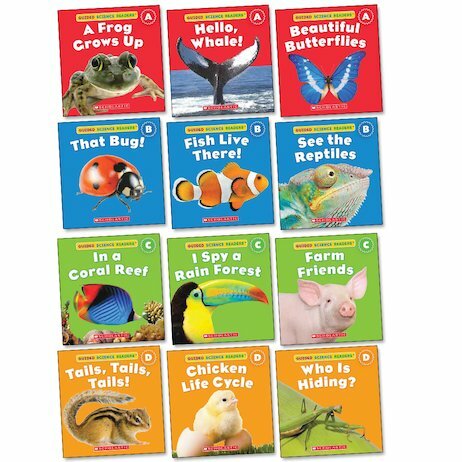 Explore nature in attractive early readers stuffed with facts and photos, at four progressive levels. Be delighted and amazed by creatures big and small, and the places they call home! From the gigantic blue whale to the tiniest of insects, these guided readers introduce you to a huge variety of creatures from around the world. There are high-flying birds, strange aquatic creatures, jungle animals, farm animals and creepy-crawly critters. Using staggered text levels that allow even the most reluctant readers to join in, these zesty and informative guides encourage an early interest in science and zoology. Guided Science Readers: Tails, Tails, Tails! Guided Science Readers: That Bug! Guided Science Readers: Who is Hiding?